Calling all Hershey’s chocolate lovers! 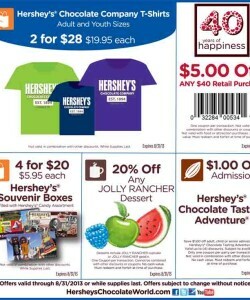 You can get a variety of things with this HERSHEY’S MULTI-DISCOUNT COUPON. With this coupon, you can get t-shirts in adult or youth sizes, Hershey’s souvenir boxes, jolly rancher stuff, discount admission to the chocolate tasting adventure and more. All of these things are possible at Hershey’s Chocolate World. You get to learn about the formulation of chocolate, and how Hershey’s came to be. It’s definitely a tour that you will want to go on. Who doesn’t love Hershey’s? This way, you can get souvenirs while being educated. This is a winner! Taking the time to learn about the chocolate everyone has come to love is a great thing. It may inspire you to start your own company one day. Not in chocolate of course, but just the concept is worth thinking about. All that chocolate goodness – you get to see how chocolate is made, what they use and the different variations of chocolate. Get the family together and figure out how you are going to spend this multi-discount coupon. You want everyone to share in the educational foundation of chocolate. This would be a great field trip for a class or school project. Everything you need is right there. You can get an A by just showing up and writing about the tasting adventure, but there’s so much more to the experience. Jolly Ranchers has a variety of flavors, but they have items and flavors that you have never even heard of. If you’re a Jolly Ranchers fan, this is definitely where you want to be. Seriously. You would be surprised to see the amount of chocolate produced and the different items available per country. Welcome to Hershey’s Chocolate World.